We here at Best Knife Set understand that times are tough right now for a lot of people. We’ve seen sales on the larger, more expensive cutlery drop off dramatically this holiday season. For this reason, we’ve decided to write an article on the best budget knives available this year. Every single knife set on this list clocks in at under a hundred dollars and a couple are less than 50 bucks. 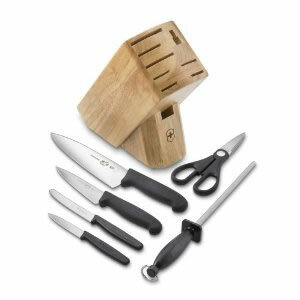 The Victorinox 7-piece knife block set comes with everything you need in a starter set of knives. You getÂ a 3-1/2-inch paring knife, a 4-1/2-inch tomato and bagel knife, 5-inch miniature chef’s knife, 8-inch full-size chef’s knife, a good sharpening steel, kitchen scissors, and an attractive hardwood block. All this for just under 60 bucks. This is the set for those who are on a budget, but don’t want to skimp on quality. 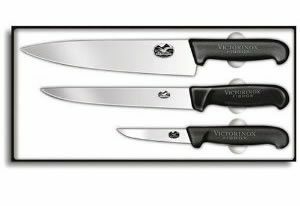 The Victorinox Fibrox 3-piece Chef’s knife set offers up three great knives for right around 60 dollars. You get a 4-inch paring knife, an 8-inch slicing blade, and 10-inch chef’s knife, all stamped from cold-rolled stainless steel. This set also features the Victorinox lifetime warranty. Rounding out the list is a set of knives that is perfect for those looking for a larger set. This set comes with a 3.5-inch paring, 5-inch serrated utility, 7-inch Santoku, 8-inch chef, kitchen shears and a sharpening rod. You also get four steak knives, a must for a family that eats a lot of meat. 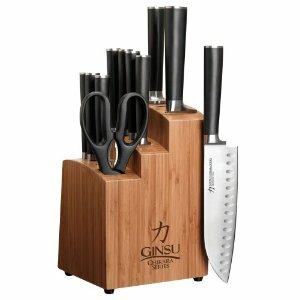 Ginsu knives feature high-carbon Japanese stainless steel and are world-renowned for their razor-sharp blades and ability to hold an edge. Prior to going shopping, do a little research so you can be sure you’re getting the best kitchen knife set.